It's almost show time for Apple's (AAPL) new mind-blowing headquarters office. New footage (below) from drone videographer Matthew Roberts hit YouTube on Saturday revealing more progress on the site's immense landscaping. The futuristic-looking headquarters will officially be known as "Apple Park" and was supposed to be ready to house employees beginning in April. Employees have not yet moved in, however. Construction will continue throughout the summer, while the relocation of 12,000 workers onto the campus will take over six months. [post_ads]The name of the 175-acre campus is in reference to the building replacing "miles of asphalt sprawl" with a "haven of green space," as explained by Apple in February. In addition, the building will run entirely on renewable energy. The combination of "advanced" buildings with miles of greenery will provide a space for employees to be creative and to work closely together as a team, Apple chief design officer Jony Ive said. "[Steve Jobs] invested so much of his energy creating and supporting vital, creative environments," Ive said. "We have approached the design, engineering and making of our new campus with the same enthusiasm and design principles that characterize our products." Apple has also announced that the new 1,000-seat auditorium on the campus will be named the Steve Jobs Theater. The building will feature a 20-foot-tall glass cylinder at its entrance and will sit on a hill overlooking meadows and the main building. "Steve's vision for Apple stretched far beyond his time with us. He intended Apple Park to be the home of innovation for generations to come," Apple CEO Tim Cook said in February. "The workspaces and parklands are designed to inspire our team as well as benefit the environment." The headquarters will include a visitors center with an Apple Store and a cafe open to the public, Apple said. The completion of the campus on the former Hewlett-Packard campus in Cupertino, Calif. appears to have been delayed by the company's extreme attention to detail, Reuters reported. The original completion date was slated for 2015. The 2.8 million-square-foot project was originally dubbed Apple Campus 2 by Apple co-founder Steve Jobs just months before he passed away in October 2011. The campus will complement its other offices at One Infinite Loop and will hold up to 14,200 employees. As of 2015, the tech giant employs 76,000 people in the U.S. alone, which accounts for almost two-thirds of its global team, according to the company's website. Jobs was known for being incredibly picky about designs, wanting the inside of a product that customers never see to be just as pristine as the outside. His perfectionism famously made him a difficult person to work under, as detailed in numerous anecdotes in Walter Isaacson's biography of Jobs. He often told his engineers, "This is s---" when reviewing their work. The in-house Apple construction crew has been overseeing the construction of Jobs' dream campus, which is thought to cost $5 billion, with a similar attitude, according to Reuters. [post_ads]Jobs wanted a circular campus that looked as sleek as the iPhone, which meant Apple had to build the world's largest piece of curved glass. The resulting picture is reminiscent of a spaceship, which is why it's sometimes referred to as the "Spaceship Campus." Over 3,000 curved glass panes made by Germany-based Seele were used to create the see-through ring. That's about 3.7 miles of glass. Seele also partnered with Apple to design its flagship store on Fifth Avenue in New York. 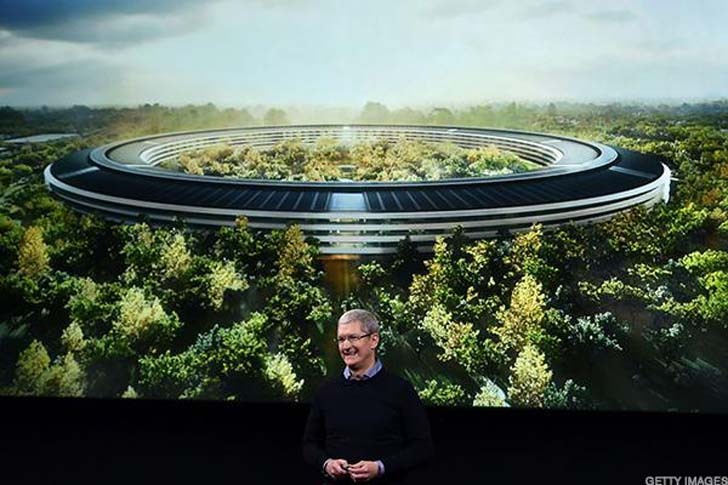 The glass-based design is what led Apple Park architect Stefan Behilng to call it "one of the most environmentally sustainable projects on this scale anywhere in the world," in a video presented to Cupertino city officials in 2014. While you may be able to see the campus clearly from a plane, those on the ground will have a harder time, as Apple wants a total of 7,000 trees surrounding the campus. Of those trees, about 1,000 were preserved from the previous Hewlett-Packard campus. The company even hired top arborist Dave Muffly to help with the landscaping, which will include fruit trees, such as apricot, plum, cherry and, of course, apple trees. Muffly's job included traveling to various nurseries to pick out specific trees that he thinks would fit on Apple Park, latimes.com reported. An anonymous source who worked on the project told the publication that Apple's landscaping vision was "ambitious." "They want to save a lot of the big trees," the source said. "And they're willing to spend the money to do it right. It's pretty exciting that they're willing to take the extra steps." The miles of greenery will also allow for two miles of walking and running paths for employees, in addition to the new 100,000-square-foot fitness center, Apple announced in a statement on Wednesday. In addition, future Apple events are also getting a venue upgrade. The campus will feature the Steve Jobs Theater, which can seat 1,000 people and features a roof that weighs 80 tons and was shipped from Dubai to California. But the meticulous requirements are perhaps most clearly seen in the interior, with the Apple construction crew requiring the concrete ceiling to look spotless on both the inside and outside. Apple also insisted that no vents or pipes be reflected in the encircling glass, Reuters reported. 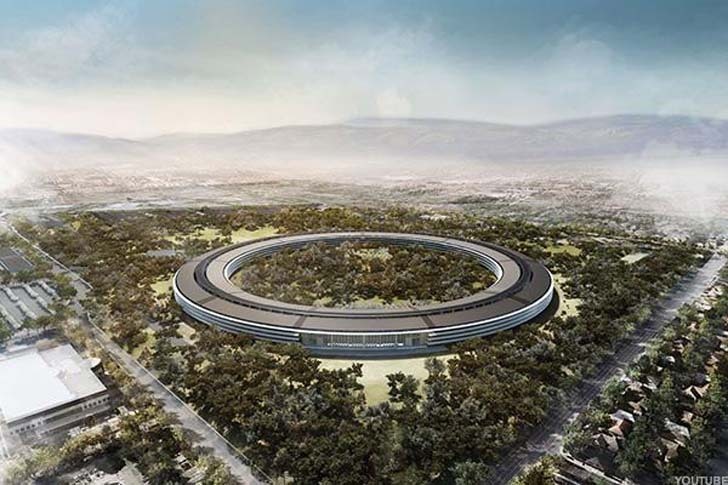 "They have arrived at design principles somehow through many years of experimentation, and they are faithful to those principles," Apple Park architect German de la Torre told the publication. Apple was also extremely picky about its signage. They were concerned about it not appearing sleek enough, much to the distress of the fire department, which had to be sure the signs were also functional enough to allow for a swift evacuation. "I've never spent so much time on signage," Santa Clara County Fire Department representative Dirk Mattern told Reuters. This attention to minute details is a testament to Job's famous obsession for high-quality design -- even for parts unseen by the customer. He once rejected the designs for the logic boards inside of the Apple II computer because the "lines were not straight enough," according to the Isaacson biography. 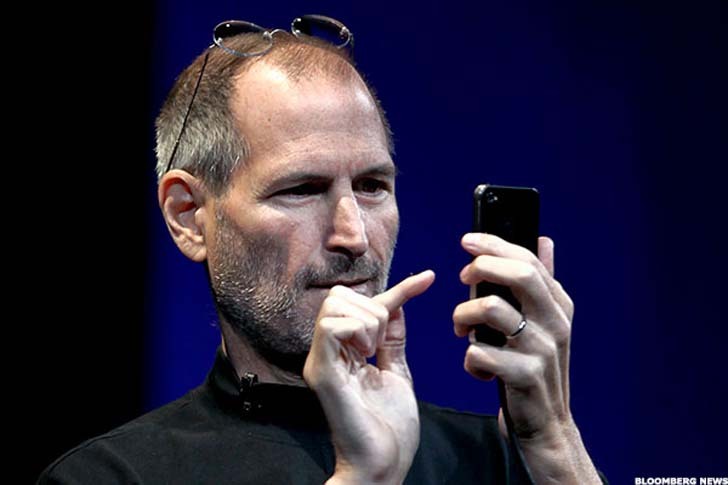 "For you to sleep well at night, the aesthetic, the quality, has to be carried all the way through," Jobs told Isaacson.